The task of transferring the old pages from my old Geocities.com website to Hoelseth.com has obviously taken longer than I had expected. The main reason is, as I have also commented on earlier, that family life and work have to come first, and in the last few years I have also preferred to spend more time on working for the Norwegian Genealogical Society, genealogical research, blog writing as well as working for Slektshistoriewiki, the Norwegian Genealogy Wiki. I am one of the administrators for the wiki and I also contribute with articles and illustrations. It is not that challenging work to transfer old pages from my old to my «new» website, but some structure changing and coding has to be done, as well as link renovation, and it is kind of boring. But I am happy whenever I get something done! Yesterday evening I finally got the Romanian Royal Family Links page with its subpages up and going again. The reason for doing it now is of course that the former King Michael's wife, Queen Anne, née Princess of Bourbon-Parma, died in Switzerland on 1 August 2016. The burial will take place in Romania on 13 August. If you have recommendations for other websites about the Romanian royal family which you think I should include, please tell! Eurohistory. 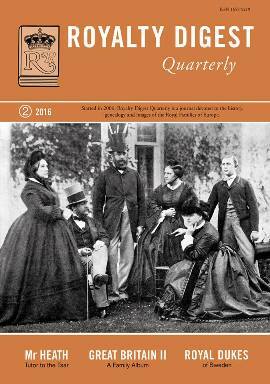 The European Royal History Journal, issue CIX, Volume 19.1, Spring 2016, arrived in early July, but as with the latest issue of RDQ, I have not been able to comment on it before now. The latest issue of Eurohistory is the first out since the publisher decided to turn into a quarterly magazine rather than bi-annual. The result is a rather thick volume with 64 pages full of articles and photos. 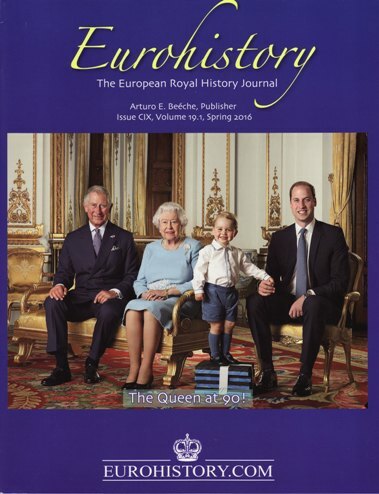 One of the official portraits taken in connection with the British Queen Elizabeth II's 90th birthday has found it's way on the ERHJ cover. It is a great photo, even if the «footstool» looks a bit silly. It helps the composition of the photo, of course, given Prince George's height, but they could have made a nicer version of the footstool, perhaps. All in all a nice presentation of four generations with British royals. One of ERHJ's regular contributors, Coryne Hall, has written the opening article The Queen at 90! Then yet another regular contributor, Janet Ashton, is back with the article War On All Fronts and the End of Austria-Hungary. "Cecco Beppe has kicked the bucket!" The title gives it all, but the focus is not only on the end of the empire, but the beginning of new states like Czechoslovakia and the Kingdom of Kingdom of Serbs, Croats and Slovenes (later Kingdom of Yugoslavia). As usual the article is based on an impressive bibliography, which includes Christopher Brennan's university thesis from 2012, Reforming Austria-Hungary: beyond his control or beyond his capacity? The domestic policies of Emperor Karl I November 1916 – May 1917, which also seems to be worth looking more into. Who Is In the Photograph? Ilana D. Miller follows ups with yet another photo presentation, this time from King Constantine of the Hellenes' christening in Athens, 1940. The photo shows Princess Alice, Prince Peter, King George II, Princess Helen, Princess Frederica (future Queen), the then Prince Constantine, Princess Katherine, Prince Paul (future King of the Hellenes) and Princess Sophie (future Queen of Spain). Marlene Eilers Koenig then follows up with the second part of Princess Augusta of Cambridge. Grand Duchess of Mecklenburg-Strelitz. The rather detailed article covers her married life and the first years of widowhood. We learn among others about her first ride in a motor car, which went well, even if she complained of a bach ache afterwards. Third part follows in the next issue, I presume. In the Footsteps of the Six Wives of Henry VIII. The visitor's companion to the palaces, castles & houses associated with Henry VIII's iconic queens by Sarah Morris and Natalie Grueninger (Amberley, 2016, ISBN 978-1445642918). Finally we are treated with a Royal News section, this time news from the Imperial, royal or princely houses of Albania, Austria, Hohenzollern, Liechtenstein, Oldenburg, Bourbon-Parma, Romania, Saxe-Coburg and Gotha, Saxe-Weimar-Eisenach, Sweden, United Kingdom, Yugoslavia (Serbia), Castell-Castell, Leiningen, Ligne, Salm-Salm, Sayn-Wittgenstein-Berleburg, Solms-Laubach and Toerring-Jettenbach. I received my copy of Royalty Digest Quarterly no. 2, 2016 at the end of June, but had so many other matters that had to be attended to before my vacation that I have not been able to comment on the issue before now. Anyway, this time the readers are treated with a photo of the Cambridge family from the 1860s, showing from the left to right Augusta, Duchess of Cambridge, Friedrich Wilhelm, Grand Duke of Mecklenburg-Strelitz, George, Duke of Cambridge, Augusta, Duchess of Mecklenburg-Strelitz, Princess mary Adelaide of Cambridge and Adolf Friedrich, Hereditary Grand Duke of Mecklenburg-Strelitz. Queen Elizabeth II of the United Kingdom celebrated her 90th birthday earlier this year, and in his Editor's Corner Ted Rosvall makes a pointg of this and lists other monarchs who have also reached the grand old age. Trond Norén Isaksen has written the opening article titled Swedish Royal Dukedoms, in which he gives an outline of the Swedish dukedoms given to members of the royal house in both medieval and modern times. Isaksen has most usefully included a map of Sweden with the Swedish dukedoms bestowed since the revival of the ducal titles in 1772. I have not much to add here, but would like to say a few words concerning Isaksen's comments on Prince Oscar (1859–1953), who forfeited his rights to the Swedish throne in 1888 when he married «a private man's daughter», Ebba Munck af Fulkila: «Contrary to what is sometimes claimed, Oscar did not receive a new princely title, nor was he created Prince Bernadotte; he remained Prince Oscar, to which the surname Bernadotte was added». Isaksen is right, of course. I must admit that I am one of those who earlier thought that Prince Oscar was titled «Prince Bernadotte», due to among others the references to «Prins Bernadotte» or «Prinsen och Prinsessan Bernadotte» in the public (government) newspaper Post- och Inrikes Tidningar. But there is no record that such a title was ever given, whether formally or informally (as in «the King let it be known»). If Prince Oscar had also lost his prince title, he and his wife would have been referred to as «herr och fru Bernadotte» («Mr. and Mrs. Bernadotte»). The reference «Prince and Princess Bernadotte» thus makes sense. Helen Rappaport has written the most wonderful article titled Mister Heath. The English Tutor who Taught Nicholas II to be the Perfect Gentleman. Rudy de Casseres has also contributed to the article. I just love articles which not only deal with royalty, but also all the people surrounding them – court and staff members, tutors and nannys etc. The tutor was Charles Heath (1826–1900). The next article, 'My dearest Patsy'. A nurse and her royal patients: Part I by Charlotte Zeepvat comes in the same category. Here we get the story of the Scottish-born nurse Elizabeth Paterson, née Stuart, who was engaged by many royal women in connection with giving births. Zeepvat is as usual also responsible for the traditional Family Album, this time the follow-up article titled The Royal House of Great Britain and Ireland. A Family Album II – The House of Hannover. Besides the introduction, the album includes 75 illustrations and three pages with genealogical tables. Coryne Hall is yet another regular contributor to RDQ (and to the European Royals History Journal as well), and this time she has made the contribution An Unusual Royal Album, which deals with an album containing hairlocks of Swedish (and Norwegian) royals and their relatives. The topic is interesting, but I wish she had done more research, or that the editor had stepped in before the article was published. When she comments on the death of the then Crown Prince Carl's son Carl-Oscar, who died in 1854, 15 months old, she claims that «His death caused a crisis, as although Carl and Louisa's daughter Louisa could reign in Sweden she could not inherit the throne of Norway.» I wonder how she got into that idea. The succession law in both Sweden and Norway was agnatic. The Swedish law was not changed until 1980, in Norway as late as 1990. She later also claims that King Carl XIV Johan «incorporated Norway into Sweden», which of course is not correct. Carl Johan's role in securing the throne of Norway for the king of Sweden is well known, but it was a personal union, Norway was never «incorporated» (as in «becoming a part of») Sweden. The latest issue also includes the obituaries of Prince Albrecht of Castell-Castell (1925–2016), written by Bearn Bilker, and of writer and Romanian royal house expert John Wimbles (1935–2015), by David Horbury. Finally, the readers get a collection of royal news concerning the imperial, royal, princely or comital houses of Austria(Belgium (Austria-Este), Bourbon-Parma, Castell-Castell, France, Liechtenstein, Oettingen-Spielberg, Oldenburg, Sweden, Trauttmansdorff-Weinsberg, Yugoslavia (Serbia) and Wurmbrand-Stuppach. Last Friday (5 August 2016) the Royal Court in Oslo announced that Princess Märtha Louise and Ari Behn, who have been married since 2002, are to divorce. The couple is going to have shared (joint) custody of the three children, who will continue at their respective schools. Princess Märtha Louise will continue to live in Lommedalen in Bærum outside Oslo. Ari Behn intends to find a place to live nearby to be close to his daughters. Both the house in Lommedalen as well as the vacation home «Bloksbjerg» at Hankø are both the princess' sole property. «Life does not always go smoothly. Both Ari and I have experienced this. But this comes even more apparent now when our life has taken some unexpected turns that we never had foreseen. In these days we will leave each other. We are ending the marriage, but will stay together in parenthood. It is unspeakably sad for both of us to discover that the road ahead of us will not go the same way it used to. We have as so many others grown apart from each other – to places we no longer meet as we did before. It is terrible to experience that there is nothing more we can do. We have tried everything over a long time, and when we still can't meet where we did before, it is impossible for us to continue. We feel guilty for no longer being able to provide the safe harbour that our children deserve. But we hope and believe that we will be able to keep our friendship through what is now ahead of us. According to the press release, Princess Märtha Louise and Ari Behn do not wish to give any further comments. They ask that the press will continue to leave their children alone. Although Ari Behn on more than one occasion has hinted that his role and life in the royal circle have been difficult and challenging, I must say I was a little bit surprised by the news. But it is of course impossible for outsiders to know what is really going on in other's relationships. Telling about the break-down of a marriage is never easy, but I think the couple and the royal court have solved it well. I don't feel we need to know more details about why the marriage broke down than what the princess has told in the statement. Hopefully the couple as well as the royal family will get through the separation and divorce as smoothly as possible and remain on friendly terms. As others have also suggested, the divorce will have no constitutional complications. I also doubt that it will affect the popularity of the royal family much. It is just sad for all the people involved. Legally speaking, the Norwegian marriage act article 21 states that «Each of the spouses may demand a divorce when they have been separated for at least one year.» The court has so far not stated the date of the County Governor's (administrative) separation order. The divorce will at the earliest be granted sometime in August 2017. Until then Ari Behn will remain a member of the royal family. Many people, including several so-called «royal experts» have commented on the separation. Johan T. Lindwall, who covers the royal families for the Swedish tabloid Expressen, claims that Ari Behn «has been a burden on the Norwegian royal house.» He is not the only one who has claimed this. Personally I feel that many people have made too much out of Ari Behn's somewhat unorthodox or «Bohemian» behaviour. He certainly has created a few headlines along the way, and his comments on a former royal staff member's working conditions were totally unacceptable, but in general I think the headlines have just been mild ripples on the water. His wife's business activities have (or are) far more problematic. Maybe it is rather the royal house which has been a burden on Ari Behn – especially on his role as an author – than the other way around? Let us just say that they have been a colourful couple. And for the record, everyone I know who has met Ari Behn personally has only good things to say about him. Lindwall also claims that «Märtha Louise har varit kontroversiell med sin änglaskola och böcker. Det gick ju så långt att hon fick avstå rätten till apanage, skattebetalarnas pengar, och Hennes Kungliga Höghet titel ....» («Märtha Louise has been [a] controversial [person] with her angel school and books. It went so far that she had to give up her right to an appanage, the tax payer's money as well as the style Her Royal Highness ...».) This is a rather misleading comment. As mentioned in the court's press statement of 18 January 2002, the Princess' decision to enter working life created a greater distance to the Royal House's constitutional role. The King therefore decided, after having consulted the Princess, that she from 1 February 2002 no longer was to be styled Her Royal Highness, but Princess Märtha Louise. The latter was as a result of the reform that the financing of the royal family and court underwent and which came into force from 1 January 2002, and had nothing to do with the sole proprietorship that was to be established. The «angel school», i.e. the limited company Soulspring, earlier named Astarte Inspiration, was established much later. The press statement concerning the future divorce was announced while I was abroad, which explains why my comments are published first three days later. Updated on Tuesday 9 August 2016 at 20:15 (couple of typos corrected).